Spacing12-18 inches between plants, 4-5 feet between rows. FoliageObovate dark green leaves. Foliage turns an attractive mahogany in winter. Flower FormSmall pink bell-shaped flowers, flower on previous years growth. FruitBright to dark red, small round berries. CommentsDistinct tart flavor, rugged and cold hardy, doubles as an ornamental ground cover. 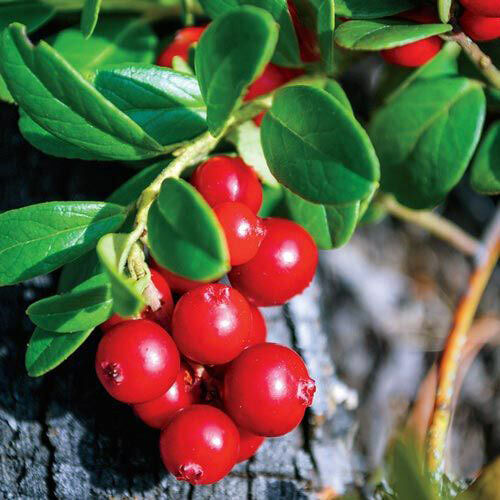 Lingonberries are rich in antioxidants, benzoic acid, Vitamins A&C and magnesium. YieldHeavy bearer. Yield potential is approx. 10 lb of fruit per sq. yard of row.